I am on the Tea Party Express tour bus traveling to our next rally in Provo, Utah. We just left St George, Utah. 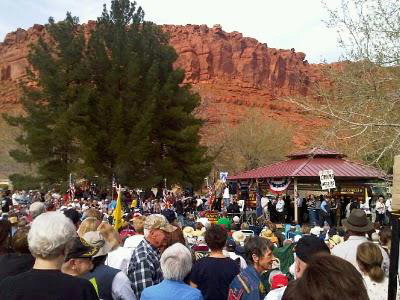 At the rallies, I perform my original "American Tea Party Anthem" song and more. I usually walk among the crowds when I am not on stage. I have attended over 100 tea parties across America and the crowds are all the same; bright, well informed, decent and hard working Americans. Today, at our St. George, Utah rally, I felt a new level of love and concern for our country. There were numerous veterans, some from as far back as Korea expressing their displeasure with the radical changes taking place in our country. Grandmothers, a few using walkers, have been following our tour since the kick-off rally in Searchlight, NV. Young parents with new born babies in arms, baby-boomers fearful about the future of their grand kids and teenagers all thanked our multiracial Tea Party Express team for our efforts to restore America. I posed for numerous pictures and signed autographs. As a black patriot, I have never felt a racist atmosphere nor a hint of violence. Yes, attendees are angry. It is the patriotic duty of all who love America to be angry. Today, several tea party attendees hugged me with tears streaming down their cheeks as they thanked me for standing up for our country. Several were also extremely moved by my signature proclamation that I am not a hyphenated American. They called me brother. 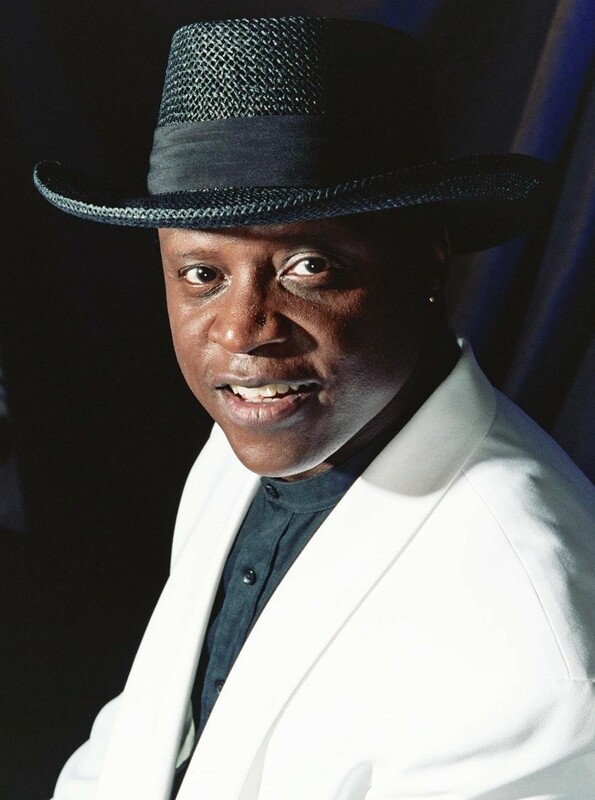 The media is littered with articles and news stories about the alleged "n" word incident in Washington DC. Black democrats claim they were called the "n" word fifteen times by a bunch of angry white tea party activists. I believe the accusation is a lie. First of all, in our high tech everyone has a cellphone video camera age, video of the incident would be posted everywhere if the incident really happened. Also, as I said, I have attended over 100 tea parties. I know my fellow patriots. If a knucklehead yelled the "n" word, the crowd would have immediately verbally attacked the idiot. This accusation is another sleazy divisive attempt by an arrogant bunch of characterless democrat race exploiters and their homeys in the liberal mainstream media to dis millions of patriots who refused to sheepishly surrender our freedom, liberty and culture to their beloved messiah, Obama. And another thing, after passing Obamacare against our will via corrupt backdoor deals, why on earth should we believe anything the democrats say regarding racist comments and threats made against them? They lie! They are characterless. They are undeserving of our respect and any benefit of the doubt. All of the news stories which accuse the tea party patriots of racism are written based on hear say by agenda driven reporters who have never attended a tea party. 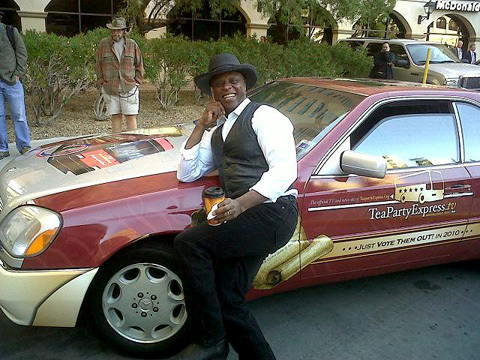 I am a black man who has been firmly embedded in the tea party movement since it's beginning. I am so sick of writing about this tired, silly and baseless accusation (racism in the tea party movement). However, the liberal mainstream media is relentless in their refusal to let it go. They have sold their souls in support of Obama's transformation of America. As I told the crowd today in St. George, Utah, "Folks, this is serious business. Our country is in serious trouble." I cannot and will not allow the liberal mainstream media and democrat's evil accusations and lies against my fine white brothers and sisters in the tea party movement to go unchallenged. God bless my fellow patriots and may God bless America.